Say what??!! Sammy Hagar is going to celebrate his 69th birthday in October??!! Yes, it’s true. The Red Rocker and former Van Halen vocalist is 68 years old yet has the physical ability, looks and singing voice of a 30-year-old performer. An apparent key-holder to – and frequent visitor of – the Fountain of Youth, Hagar looked trimmer than recent TV appearances portrayed as he and his all-star solo band, The Circle, commandeered the stage at the Walmart AMP in Rogers, Ark. on July 2. Following a brief, moving video history of Hagar seen on the amphitheater’s massive side-of-stage screens, Hagar and his Circle comrades – former Van Halen bassist Michael Anthony, Led Zeppelin drummer Jason (son of original Zeppelin drummer John) Bonham and guitarist Vic Johnson from Hagar’s Wabos band – first strolled into the stage lights at 8 p.m. The quartet then seemingly smiled continuously for 15 minutes, and their personalities retained a playfulness throughout a set list that digged heavily into Hagar’s guitar-slinging past. Tracks by Van Halen, Led Zeppelin and Montrose fit comfortably next to top-level examples of Hagar’s solo work to comprise a virtually flawless, 105-minute set. Hagar’s air-punching anthem “There’s Only One Way To Rock” stormed from the starting gate first, with Johnson’s six-string results taking no prisoners in the ultra-clean sound mix. 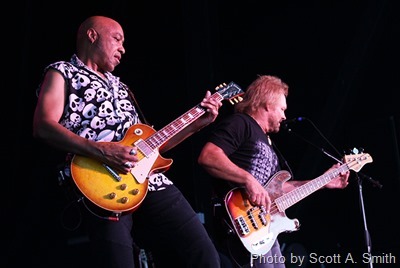 Johnson, as he did with Hagar’s Wabos band at the Tulsa Hard Rock back in January 2013, embraced his duties of heavy lifting, tackling not-so-easy guitar parts originally created by Eddie Van Halen, Jimmy Page and the late Ronnie Montrose with ease. Johnson possibly had the most difficult job of the evening, but like Eric Clapton, Johnson never really looked like he was struggling. Johnson’s playing was fluid, ferocious and distinct. Anthony, always a rock-solid bassist and one of Hagar’s closest pals, showed that his singing voice has been preserved as well as Hagar’s vocals. Anthony’s harmony vocals – that’s Anthony’s high back-up voice heard on all those classic-era Van Halen records – were as eerie sounding (in a great way) as always, and he pulled wonderful, full-sounding notes from his Schecter bass. 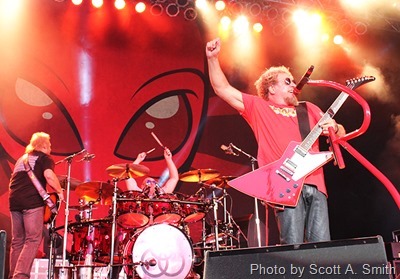 As great as Chickenfoot’s hea dlining set at the Rocklahoma music festival was in 2012, The Circle’s concert in Rogers might have been even better. “Heavy Metal,” “Poundcake,” “Right Now,” “Whole Lotta Love,” “Finish What Ya Started,” “Little White Lie” and “When the Levee Breaks” all were winning moments of an upbeat evening. A two-man take (Hagar on vocals and Johnson gently strumming a white Fender Stratocaster) on Van Halen’s under-appreciated “Dreams” resulted in 100-percent magic that, at least during those five minutes, bested the 1986 studio original. The sing-along “Mas Tequila” and the song that probably isn’t a favorite of law enforcement officials, “I Can’t Drive 55,” were danceable fun in the venue’s party-like atmosphere, as were the front-of-stage confetti cannons, which shot massive, orange streams of soft paper that literally covered everyone standing from the sound-board forward. Almost more striking than the musicianship was the interaction between Hagar, Anthony, Bonham and Johnson. They joked with each other onstage, often in mid-song, and they shared frequent eye contact (a rarity not even found in some of my favorite bands). The Circle members like each other. In the words of actress Sally Field, they really, really like each other, and folks, that respect-filled partnership can’t be faked on the stage, night after night after night. Ever.